Summer is in full swing at Londolozi and the warm heady nights are once again filled with the familiar chorus of frogs, nightjars and the constant ringing of cicadas. However, there is something missing from the nocturnal noises – the spine-chilling whoop and howl of the Spotted hyenas as they set out on their late night foraging. So what could have happened to these denizens of the night? There was a time when a walk back from dinner to the staff accommodation involved at least two or three close encounters with a big hyena; a time when the kitchen door was shut tightly behind you at night; a time when hyenas would often rush through the boma in the hope of snatching a free meal from the grill. 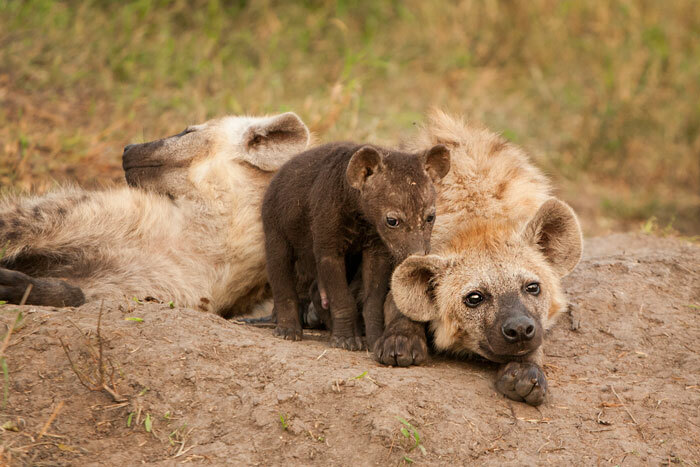 These days, I encounter hyenas in camp at night maybe twice a week at the most, and I have forgotten my shoes outside my room for a couple of days at a time and not had them chewed to pieces. There is no denying that hyena numbers around camp have dropped in the last two years. We still see them, but nothing like as regularly. 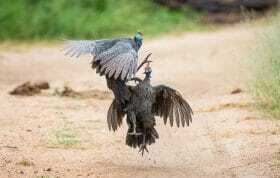 The reason, according to most of the senior rangers and trackers, is the Majingilane. 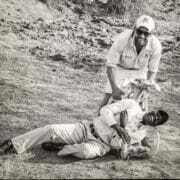 It is not just other male lions that incur the wrath of the Majingilane coalition. Hyenas are their main competition for food, and any individual slow enough to get caught by the coalition is in for a severe mauling at the very least. It seems that as the Majingilane tighten their strangle-hold on the central Sabi Sand, the hyenas have responded by moving elsewhere. The once numerous den-sites on Sparta have dwindled to one solitary site, while far to the south, just out of reach of the long arm of Majingilane law, den-sites with at least 15 youngsters have sprung up and have been providing visitors with fantastic viewing opportunities for months. Active dens like this are generally only to be found on the fringes of the Majingilane’s territory these days. 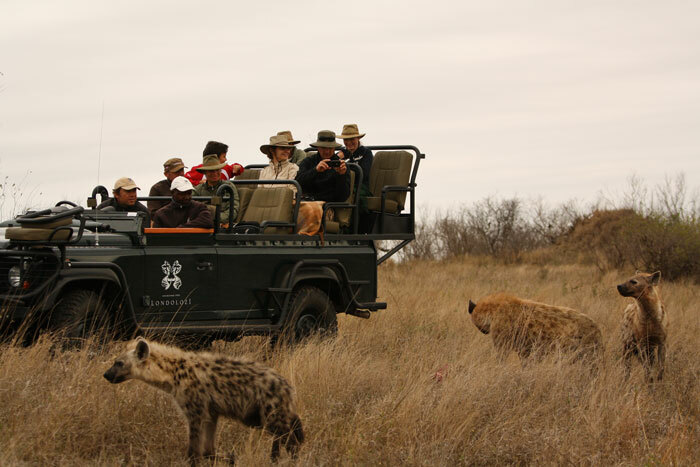 It is not just the camp staff at Londolozi who have picked up on the hyena exodus. The leopards have also clearly sensed the change, as we are seeing fewer kills being hoisted at the moment. 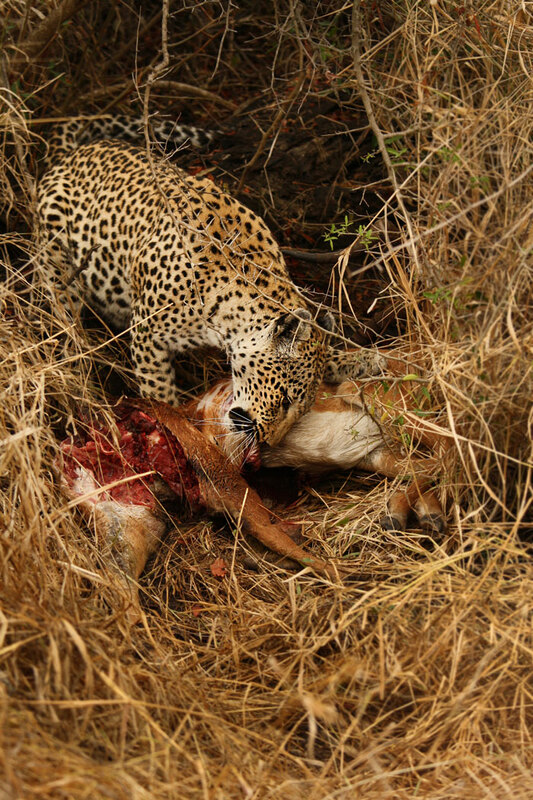 The danger of being robbed as the sun starts to set has dwindled, and leopards are more comfortable feeding off their kills whilst they are still on the ground. This hyena had just robbed the Nyelethi 4:3 young male of a freshly caught impala. The leopard had taken it down in the gwarrie thickets after a long stalk, but the hyena had heard the alarm snorts of the impala as they scattered. Before the leopard could catch his breath after the kill, he had been robbed! This photo was taken literally 5 seconds after the previous one. 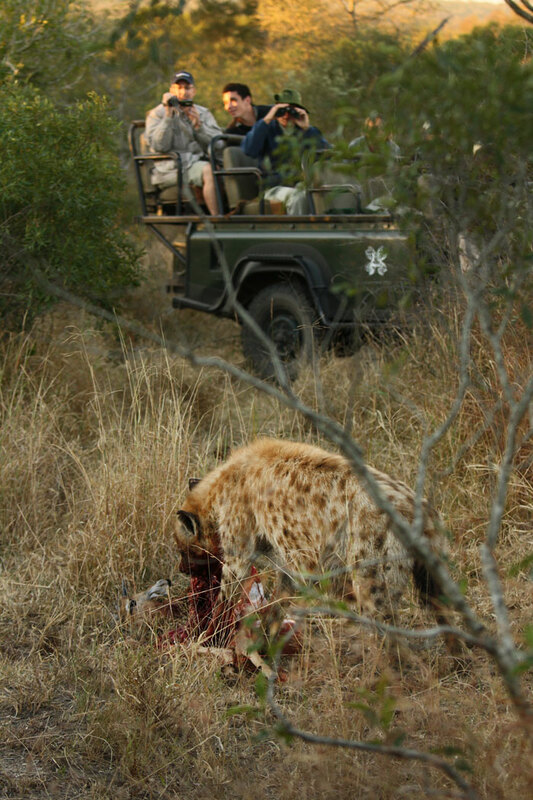 8 hyenas came racing in to claim Maxabene’s kill. The aftermath. 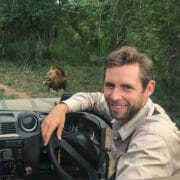 Ranger Tom Imrie watches a few of the clan as they pick up the scraps. This is part of the ebb-and-flow cycle of the bush. There will come a time when the Majingilane are dethroned, and a new coalition will reign supreme. Battle lines will be re-drawn. 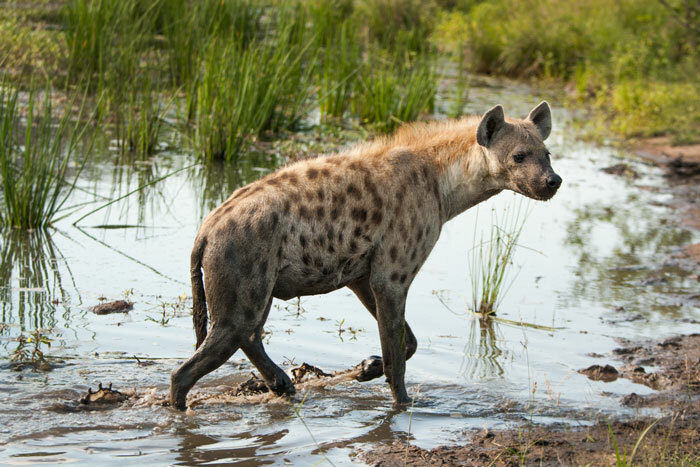 Hyena populations may experience new pressures from the South or other directions. 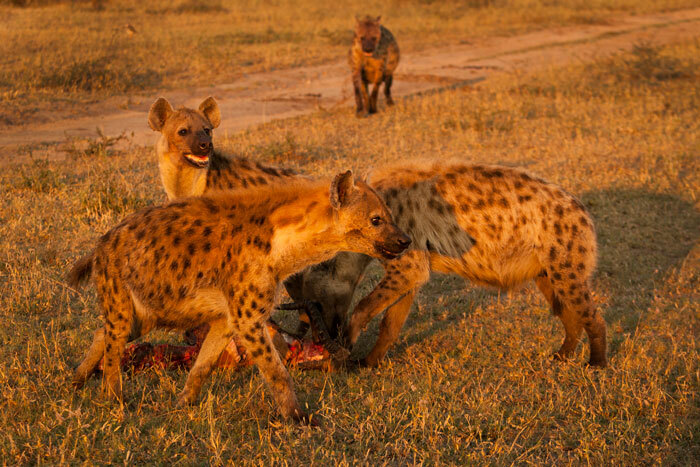 Four hyenas finish off the carcass of an impala ram. The impala had been killed by a rival male during the rut. 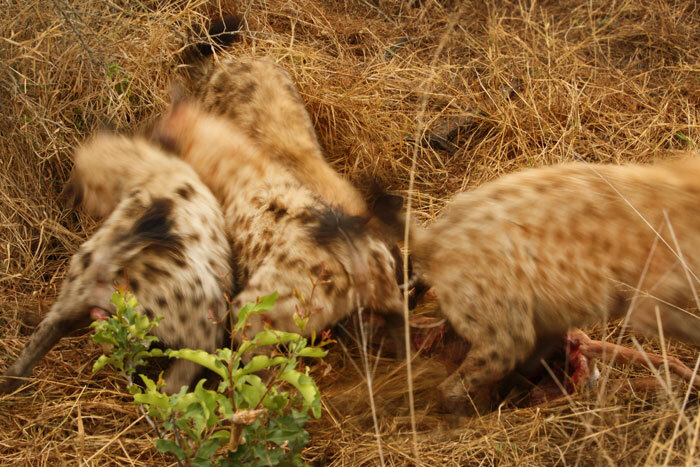 Four hyenas around a kill is an uncommon sight at the moment. Sooner or later, we are confident that the eldritch cry of the hyenas will once again fill the night air around the camp, no longer a distant wail in the darkness. on Where have the Hyenas Gone? Hi James is that densite down south (just past Wilkinson) still inhabited? With this heat I’d stay underground! Greetings to all. 4 fully grown male lions is a force to reckon with. If I were a hyena I would keep my distance. Thanks you for the update on the hyena. I find them one of the most interesting mammals in the bush. 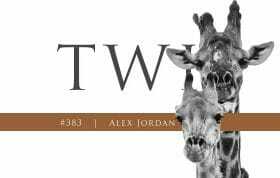 Interesting twist in predator dynamics! Congratulations to Majingilane! Few years back, hyenas tripped off the tails of Tsalala lionesses and snatched kills so often. I am pleased to hear Hyenas are pushed out. Fascinating. I wonder in areas where lion hunts are allowed and male lions are taken out regularly, if hyenas mulitply tremendously and become stronger than the lion prides themselves? Such an interesting article… It never ceases to amaze how the ebb and flow of nature changes what we experience in the same place over time. Water can often be the cause of such change – either via direct rainfall like that experienced in the Sabi Sand or by annual floods in places like the Okavango Delta, where a river that had been dry for years suddenly flows again and changes the lives of the animals that live there. Competition between predators obviously also can cause changes in their immediate environment depending on the breeding success of one or the other. Your observation regarding leopards changing their habits at Londolozi certainly proves that some animals will adjust very quickly to changes in their surrondings. Thanks for your comments, good to hear from you!